Police officers investigate the scene where authorities say Amonderez Green shot himself after exchanging gunfire with the police Oct. 28, 2015, in St. Louis County. 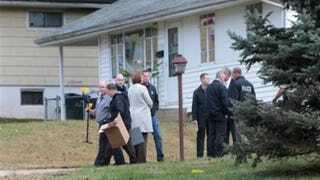 St. Louis County Police said Saturday that the county medical examiner’s autopsy concluded that Amonderez Green died from a self-inflicted gunshot wound under the chin, the Associated Press reports. The bullet was fired from a .38-caliber revolver, which is the same type of gun that police said Green used during a shootout with them. According to the St. Louis Post-Dispatch, police in the area received a call Wednesday that Green, 18, was possibly suicidal. Police officers from the Normandy, Mo., and nearby Ferguson, Mo., police departments found Green walking in the area and tried talking to him. But Green refused to cooperate, authorities said. The black teenager pulled out a gun and fired at the officers, according to the police version, reported in the newspaper. The Normandy officer tried to use a Taser on Green. When that failed, the officer responded with gunfire but missed. Green fled as he fired an additional shot at the police who were pursuing him. The police said they found Green on the ground with a single, self-inflicted gunshot wound. He died Thursday at a St. Louis hospital. Green’s family showed up at the scene and immediately disputed the police version, the Post-Dispatch reported. “What they’re saying is a total lie,” Green’s father, Jermell Simpson, said, according to the newspaper. Simpson added that he and other family members told an arriving officer that they “had it covered” prior to Green’s confrontation with authorities. The Normandy officer, who is white, is on paid administrative leave. Authorities said the incident is still under investigation, AP reports. Read more at the Associated Press and the St. Louis Post-Dispatch.